Pure adrenaline among treetops expects visitors in the 1st adventure park in Tyrol, located in Fulpmes. 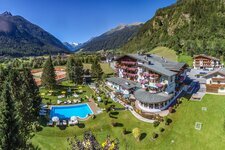 The high rope course is situated in the beautiful Stubaital valley. 13 different courses featuring 130 obstacles give variety. With its special playground the Stubaital high rope course is a destination for the whole family. Thirst for adventures? Just come to the 1st adventure park and biggest high rope course of Tyrol and you will feel the rush of adrenaline! Various challenges high above in the air expect you in this adventure park in the Stubaital valley (Stubaier Waldhochseilpark). And the obstacles you have to leave behind are sometimes really tricky. Crossing ropes, swinging steps, flying fox, pending bridges - all these obstacles are pending among the treetops up to an altitude of 18 metres. 13 different courses featuring 130 obstacles give variety and a day in the high rope course stands for fun and action for the hole family. However, not only aloft you can make breathtaking experiences, but also on the ground there is much to see, e.g. interesting educational trails on the local flora and fauna, a vast children’s playground for the little ones as well as the “Kraxl Hütte” offering regional delicacies. Moreover there is a comfortable blockhouse for parties as well as a romantic camp fire place. A visit to the high rope course does not only build the team spirit, but also increases self-confidence and is fun, fun, fun! Family tickets are available.